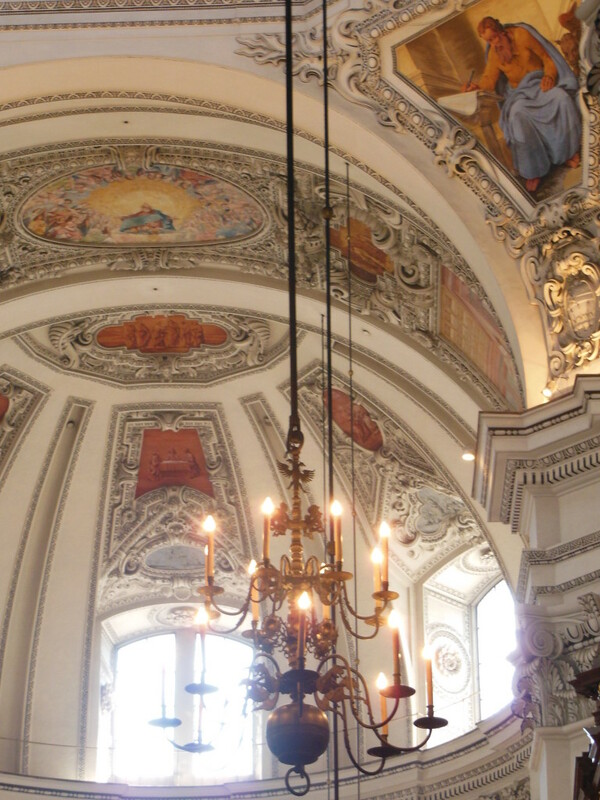 Attending mass in the Salzburg Cathedral was the most memorable experience of a wonderful trip to Europe this summer. The building’s interior was beautifully ornate, but not gaudy. The music included organ, orchestra and, I think, more than one choir. Add to that, the awareness that this was the very church at which Wolfgang Amadeus Mozart was christened. In his role as Court Organist, Mozart composed much of his sacred music almost exclusively for this Cathedral. I had two very strong impressions during this mass. The first impression–It’s not about me. The organ, choirs, and orchestra are placed behind and far above the congregation. This placement reinforces the idea that I am not the primary audience for their performance–I can’t even see them. Back home, it’s not about me either, but the praise band occupies the same place as a performance band, so I have to remember that they aren’t there to please me. It doesn’t matter if I don’t like the style in which one of the songs was presented. Nor does it matter that I don’t “feel” like praising God today; he’s worthy of my praise regardless of how I feel. The sermon’s relevance to me is not the standard by which it ought to be judged. Everything in any church service is directed toward the worship of the triune God. But back home, sometimes I forget. 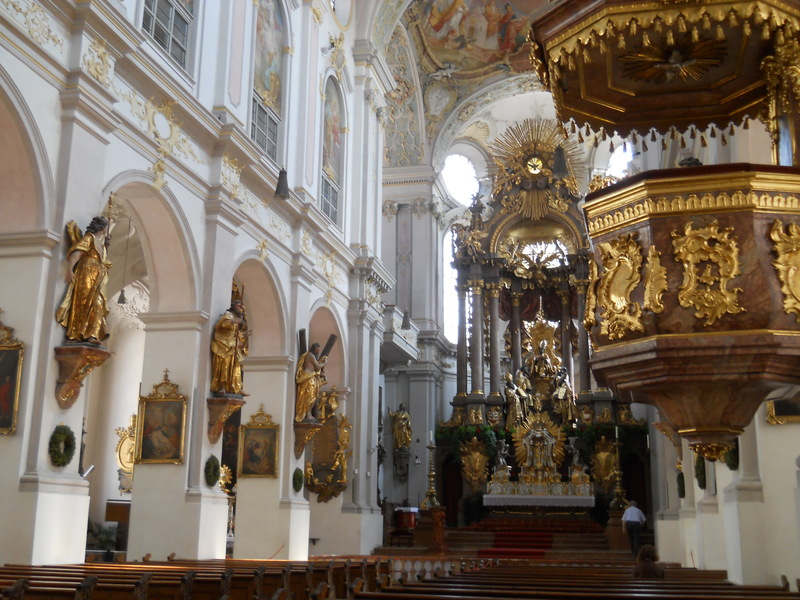 First Impression: In Salzburg Cathedral, my experience wasn’t the priority. The whole thing was in German, and I don’t speak German. I ended up thinking about how the audience of every service, is God; he speaks German. He also “speaks” Evangelical, and Reformed and Catholic. I imagined how rich God’s experience of worship must be when he is being praised simultaneously in every language and cultural expression that there is and ever was. Then there were the pews. Even in this most beautiful of churches, the uniquely carved benches are not comfortable. The seat is set at 90 degrees to the back, which has a board running across it as an elbow rest for the kneeler behind me. This makes it very uncomfortable to lean back. These seats were definitely not designed with my comfort in mind. It certainly is not about me. I’m talking about architecture, craftsmanship, beauty, painting, and music. Every sense encounters something incredible. Enough said. If I combine my first two impressions . . .
All that excellence which I so enjoyed doesn’t exist for me at all. All that I see, hear and enjoy are pure grace. The grace I receive through the worship service in my home church is no less than that with which I was overwhelmed that Sunday morning in Salzburg; the only difference was my awareness of it. St. Vitus has a commanding view of the city of Prague. This Gothic structure is visible from all over the city since it stands within the castle complex situated on top of the highest point in the city. Getting into the service was a little bit of a trick because church officials stood at the door so as to prevent tourists from entering the church before mass, while at the same time allowing worshipers to pass. We fell into both categories, I suppose, but we entered unimpeded because we approached the door with the confidence of a parishioner. Others more hesitant were refused and had to wait in the long line until noon when the last mass was over and the camera-toting tourists would be let in. This was the oldest of the cathedrals in which we worshiped on this trip to Europe; parts of the structure date back to the 14th century. The age of the church facilitated a connection to the medieval worshipers who also looked up into these same ceiling vaults. The whole service was, of course, in Czech, so I had no chance of getting anything out of the sermon. 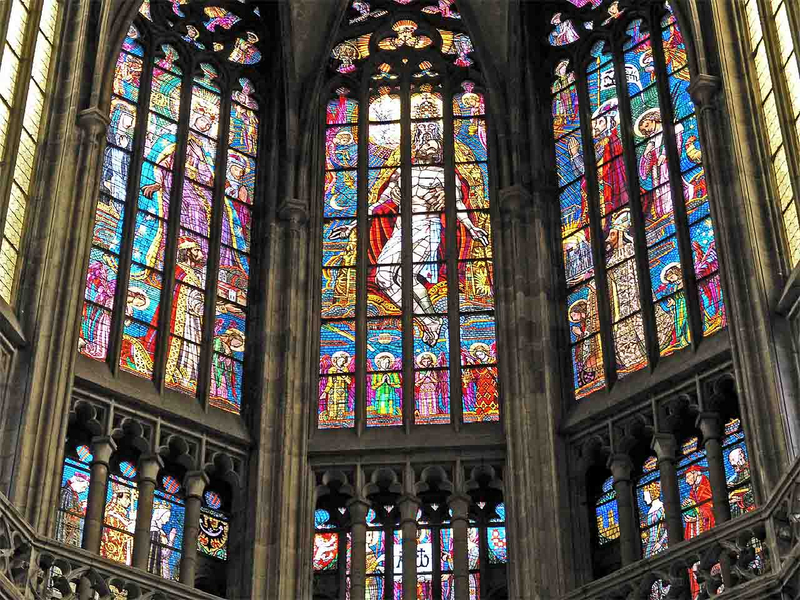 Instead, I studied the stained glass windows that rose far above the old priest who was delivering the homily. The highest and most central figure was God the father embracing his crucified son. Beneath these figures were smaller haloed saints and kings. All these figures were attended to by angels which were arranged according to their heavenly status. Beneath these were even smaller images of priests and nobles. From my position in the pew, I looked up to them all. The windows reinforce the worshipers’ correct place in the hierarchy of the universe. This idea–the idea that human beings have different value–is alien to us today. We’ve been taught that “all men [and women] are created equal” and wage war against any notion of the inherent superiority of one individual over another. Not so in the medieval world. Mankind was seen as higher than the animals and the rest of the created order, and a lower being than the angels. God, as creator and savior, was sovereign above them all. No living human beings could be measured against the greatness of the saints who came before, and no ordinary human could be compared to the greatness of one’s king. The people who lived in the medieval world, those who built this cathedral, accepted this hierarchical nature of reality. An appropriate response to those above oneself is awe and solemn respect, and this beautiful window would have evoked this response. We are no longer as capable of experiencing the same sort of awe and solemn respect as our ancestors because there is no other self that is inherently superior to my self. Living in a medieval society which reflected the hierarchical view of the universe was often a restriction of freedom. But at the same time as they restricted, these orders also gave meaning to life and the idea that some occasions warranted pomp and ceremony. This idea is natural to a people who understand that the universe is full of things greater than themselves. Although it is hard for us to understand, those honoured through pomp and ceremony in medieval society did not think of themselves in a self-important sort of way; they were living in obedience to the structure which undergirds the universe. We sometimes struggle to understand the occasions of pomp and ceremony. I recently heard a person who had only recently moved to Canada express incredulity over the reaction of many Canadians (and of course the English) to the recent birth of a son to William and Kate. He couldn’t understand what makes this birth any more special than any other? The same question would likely be asked of royal weddings and coronations. The overwhelming expression of joy over a royal birth or other special events in the life of the English royalty is a vestigial response to a world that understood the relationship between hierarchy and awe, and the relationship between awe and ceremony. Perhaps, the more peculiar we find this behavior, the flatter our world is. In The Malaise of Modernity, philosopher Charles Taylor suggests there have been significant consequences to this shift from the medieval vertical to the modern horizontal understanding of humanity and society. He says we have lost “a heroic dimension to life. People no longer have a sense of a higher purpose, of something worth dying for” (4). Another consequence is we have become more self-centred “which both flattens and narrows our lives, makes them poorer in meaning, and less concerned with others or society” (4). We Christians have a problem in that we tacitly embrace the modern, flattened view of the universe, except we retain one aspect of the older view–God retains his position at the top. The rest of the hierarchy has been disassembled, and with it we’ve lost much of our capacity for awe, and pomp and ceremony no longer make much sense. If this is the case, are we not missing something as we approach the throne of God in worship? The cathedral is a celebration of another view of the universe. It’s not necessarily a true view of the universe, but we’ve got to understand that the modern view isn’t true either. The vast internal spaces overhead and the beautiful stained-glass windows begin to evoke the sense of awe that would have powerfully affected the experience for those who first worshiped in this space. What my experience in the cathedral in Prague did, was give me a hint of my capacity to experience my own smallness and, consequently, awe for He who is so much greater than myself. I love to go to church in cathedrals. On our recent trip to Europe, my wife and I attended services in the cathedrals of three different cities–Salzburg, Vienna, and Prague. Worshiping in these cathedrals was one of the highlights of a wonderful trip. Holidays are a great opportunity to visit other churches. Each cathedral is very different as are the services. If approached with an attitude of humility, it is very good for Christians to worship with believers of different traditions because it helps to broaden our understanding about ourselves, the Church and the God we worship. All three of these services were very different from the very large Evangelical church I attend every other Sunday of the year, and the experience provided some significant insights that I will share over the next few posts. One of this most fundamental lessons that one can take away from a very different worship experience is a challenge to the idea of what is “normal” in worship. The essential purpose of all Church services whether in a gym or cathedral is the worship of God–as Father, Son, and Holy Spirit. It’s very easy to fall into the idea that the way my church/denomination worships is “normal,” and alternative approaches are abnormal and inferior. Honest encounters with difference can help dispel these harmful notions. Before a Protestant participates in a Roman Catholic mass, it is important to appropriately frame the historical relationship between these two branches of the Body of Christ. It is not productive to adopt the simplistic narrative that says the Roman church was corrupt and encumbered by extra-Biblical doctrines and rituals of which the church needed purging. Rebellion against corruption and some theological imbalances were a part of the early Reformation, but it quickly became something else. One of the most significant, and positive changes of the Reformation was a rediscovery of Grace. But this wasn’t the only change. The Reformation shifted authority from the Church and tradition to the individual. This is not a shift toward a more biblical Christianity. Before 1517, the Bible was read in Latin and interpreted by the church through the filter of a long tradition. The Reformation resulted in Bibles written in the vernacular so people could read and interpret it for themselves. Individuals could also access God more directly without the mediation of a priest. These changes were perhaps necessary in that they recognized that faith had both an individual as well as a collective component. But with reforms such as these, the Reformation also ushered in a significantly different way of thinking, about the self and its relationship to authority. These changes prompted other changes which have affected Western civilization ever since. It’s why we have so many denominations in the church. Liberal democracy couldn’t be conceived without it. Moral relativism is its logical end–most of the most contentious issues in our culture today are a result of the individual asserting its autonomy. The Reformation may have initially asserted individuality, but this grew into the individualism which dominates our culture today. We understand the self as autonomous, there is no greater authority. “My rights, my choice” is the modern mantra. There’s no doubt that the church needed some reform in the 16th century because it was filled with the idolatries of the day. But we fool ourselves if we think we are not equally susceptible to the idolatries of the world. One of the main idolatries in our culture is Individualism and worship of this idol has permeated the western church. One of the ways this is seen is with the emphasis in Christian circles on “a personal relationship with Jesus Christ.” Although this is an important dimension of the Christian life, the Bible has much more to say about how we are to live in community than it says about a personal relationship with Jesus. This imbalance can often be seen in the language we use around baptism of adults and even the professions of faith of those baptized as infants. We can also see it in the songs we sing that are full of the pronouns “me” and “I.” We see it in our interpretation of the principle of being “salt and light” in the world to be an individual, rather than a collective mandate (for example when we choose and education for our children). We have the same problem that every church of every age and every place has–we are blind to our idolatries. By humbly engaging meaningfully with Roman Catholics (or Protestants from non-Western societies) we can more easily see our own idolatries. Worshiping in a cathedral alsays gives me a glimpse of a time when Christians weren’t so immersed in the worship of the self.